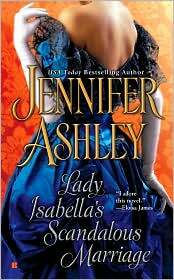 Lady Isabella's Scandalous Marriage is the second book in the Mackenzie brothers series by Jennifer Ashley. 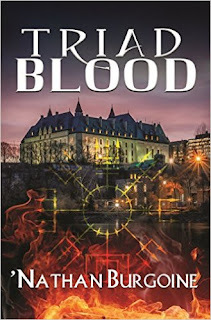 The Madness of Lord Ian Mackenzie, the first book in this series, was a wonderful story and I was really looking forward to reading more about Mac, Isabella and the Mackenzie brothers. This is a story about a second chance at love, a trope I usually love. Mac and Isabella are married but have been separated for a few years after a turbulent marriage. They still love each other, but there's a history of pain and lack of forgiveness between them. Mac made mistakes during their marriage and Isabella is unwilling to give him the second chance he needs. In this story Mac finds a way into Isabella's life again, and he does everything possible to win her back fully. She, on the other hand, struggles between wanting and enjoying Mac physically, and accepting him back into her life as a true husband. Lady Isabella's Scandalous Marriage was an average read for me. The story itself is interesting, the characters are likable, and I enjoyed the family dynamics between the Mackenzie brothers, Beth and Daniel. Unfortunately, I had a problem with the way Ashley uses flashbacks to incorporate Mac and Isabella's past history into the story. Right in the middle of a conversation and even in the middle of love scenes, the characters flash back to a past scene or reminisce about a past event. This happens repeatedly throughout the story, diminishing the impact of the scenes and the characters' present situation. This frustrated me personally, particularly when it happened in the middle of the love scenes. There's a mystery that ends with lots of predictable drama. Although this is not my favorite book of this series so far, I did enjoy the interaction between the Mackenzie brothers. I'm still looking forward to reading Cam's story and will continue to follow this series. Source: Copy of ARC received from Tracy - Thank you! Yeah, I wasn't a huge fan of this one. I gave it a 3.5. It wasn't the flashbacks but the teasing and indecisiveness of Isabella that got me. I wasn't a fan of the impersonator either. I haven't read this and honestly, I don't think I'm going to read this now. I am also not a fan of flashbacks in the middle of an interesting scene. It definitely takes out the momentum and the excitement. But, I almost bought this novel, one day while at Shoprite, (yes I also buy novels at the grocery store), but instead I remained calm and simply took picture of the cover, thinking I might buy someday. Tracy, I agree with you about Isabella's behavior in the story. Her almost "teasing" attitude was quite frustrating, and the impersonator part of the story was weak... but I thought without both, we wouldn't have had much of a story left. :( The flashbacks yanked me out of the moment every single time and after a while, I couldn't enjoy their present or past moments. Weird. I think flashbacks are a difficult thing to effectively incorporate in a story. Right in the middle of love scenes, though? uh oh. I don't know, from what I read so far - your review and others - it seems to me Mac and Isabella are really volatile characters. I was excited at first that this was coming out... but now, I don't know anymore. Sigh. I don't know what to tell you, Nath. In the past they were volatile, but in this book they work out their issues. I really liked Mac. And Isabella, although frustrating in her indesiveness, is also a likable character... it's just... hmm... well, maybe you should read it and see. ;P I'm definitely reading Cam's book, though! A C? I think this is going to be a library book and one I'm not rushing to read. Thanks for the review Hils!